For Christmas this year, Teague and I asked my parents & grandparents to help solve our dirty dish dilemnas, and they definitely delivered. I can’t tell you how excited I am. I hate, hate, hate coming home to a sink full of dirty dishes every night. Even if the whole house is clean and neat, the dirty dishes spoil everything. Plus we waste gallons of hot water the way we’re currently washing them all willy nilly like. You have no idea how this will change your life. Food tastes better. The air smells fresher. It is one of the greatest modern inventions of our time. Hey, Greg said exactly what I was thinking. Congrats, guys. 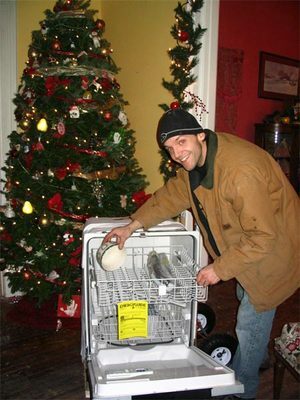 I really had serious dish washing issues before the miraculous dishwasher came along. All praise to the dishwasher!